AllThingsDigitalMarketing Blog: SMWF - North America, November 1 – 2, 2011: You should have been there! SMWF - North America, November 1 – 2, 2011: You should have been there! 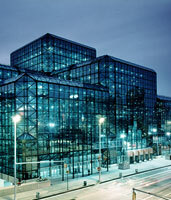 See what you missed by reading some highlights of the SMWF (Social Media World Forum) - North America in NYC at The Jacob Javits Conference Center November 1st – 2nd, 2011. 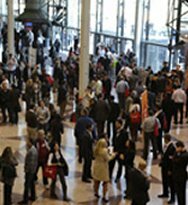 On Tuesday, November 1st, over 2,500 professionals in all things digital and social media filled the exhibit hall at New York City’s Javits Centre to attend two days of one of the most premiere interactive conferences, SMWF. New to this year's event were panel discussion formats, tweet up panels, on stage interviews, open 'Q&A' portions, audience sourcing debates and break-out group discussions enabling attendees to explore in-depth the key social media platforms, and how they can enhance marketing. There were over 100 leading social media speakers that read like a who’s who from all things digital marketers, social networks and brands providing a wealth of presentations about brand case studies with intensive workshops and plenty of networking among cutting edge players. The goal of the conference was to inform, interact, inspire and share how deeply social media can assist our businesses in connecting with and engaging customers. Mission accomplished! • Twitter applications and mash ups examined"
For many businesses, the trick is not just monitoring their social media conversations, but the ability to manage multiple social channels by combining elements of customer service, marketing and PR into a integrated customer and brand centric unit. Among the booths I stopped by was Badgeville, an innovative social loyalty smart gamification platform. Using Badgeville, brands can reward users with real time achievements and reputation while at the same time driving user behavior, achieving business goals and measuring and optimizing user engagement. Badgeville looks like a fun way to keep customers connected to your brand. Next up was a presentation by Jane Schactel, Director of Social Media for Bing and Matt Britton, founder and CEO of Mr. Youth. ► Ambassadors - often celebrities or public figures and often paid for their endorsement. The consumer-centric brand requires four things:. 4. Recognition - give loyal users badges, a feature on the site, a special offer, etc. Parting thoughts: Social media can give more relevance to search and search can give more credence to social media. Lastly, I visited the Meltwater Buzz Booth, a social media monitoring platform. Melanie Zachariades explained how Meltwater Buzz can help you mine your social media mentions and gain insight from them. So what do you think the long range effects of social media will be on brands? Twitter, Facebook, Tumblr, and a host of others are changing the ways businesses see and interact with their customers. Many thanks to SMWF for continuing to provide such informative and exciting conferences! The way I feel about this is if your into digital marketing at all! you should have been there. I think going to this “Engage with the world of Social Media Marketing” makes it easy to interact with other people who are in this field! That many of Internet at home entrepreneurs have not even begun to consider Facebook as one of most important tools in their arsenal of online marketing.